Additional Trick: – Getting irritating error message Exchange mailbox has exceeded the maximum number of corrupted items. 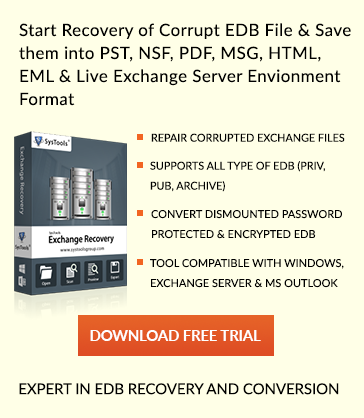 Convert Exchange EDB to PST format and resolve this issue easily. It is a type of error that can also disturb the whole migration process. Therefore, after identifying the cause behind the occurrence of this error, various methods to rectify error “Mailbox Exceeded the Maximum Number of Corrupted items for this Request” are discussed. The main reason behind the occurrence of this error is, if the mailbox has exceeds the maximum number of corrupt items during migration, then this error will definitely occur. It is because one can only migrate only finite number of Exchange mailbox. If the number of mailboxes exceeds the set limit, then migration process is paused in between. Another possible reason behind this error is that the Exchange server itself is corrupted, which may also generate leads to this errors. It is because if a mailbox is corrupt then it must have corrupt emails or attachments. Hence, all such mailbox does not allow to be migrated. This error is mainly seen during migration from Exchange Server 2010 and to all above versions Exchange. There are various manual approaches available that a user can use to fix error “Mailbox Exceeded the Maximum Number of Corrupted items that were Specified”. One can refer any of them based on their preference. Point to Remember: One needs to have the AcceptLargeDataLoss switch if a user is setting the Bad Items limit close to 50. The above method will remove corrupt mail items from isolation. An administrator can use the built-in Exchange ESEUTIL command. One can easily use this tool to perform both hard and soft recovery on offline Exchange Server. In order to use this tool, one must have administrator rights and must be technically stong. Now, to repair the corrupt database, one can use this ESEUTIL command with the /p switch. After that, it is followed by Eseutil/d command in order to defragment the recovered database. In last, one can check the database using ISInteg command. In the above post, a Professional EDB File to PST Converter and various other free solutions are discussed to fix “Mailbox has Exceeded the Maximum Number of Corrupted items” are discussed. There are various limitations in manual procedure due to which a user may fail to perform. To run manual process, user needs to be technically strong and if not done in a correct manner, then it may have an adverse effect. Thus to overcome all such limitations, a user is suggested to go for a professional solution.